Book Summary from Goodreads: This is the story of one baby’s journey from her birth parents in China, who dream of a better life for their daughter, to her adoptive parents on the other side of the world, who dream of the life they can give her. a moonlit, winding river into the loving arms of her new parents. 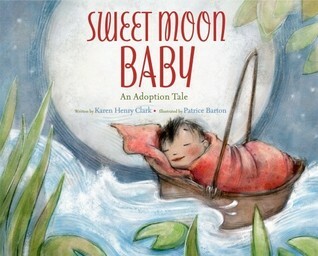 Perfect for bedtime reading, Karen Henry Clark’s poetic text, reminiscent of a lullaby, and Patrice Barton’s textured and gentle-hued illustrations capture the great love between parents and children and the miraculous journey of adoption. Heather’s Review: The first thing that struck me about Sweet Moon Baby is the beautiful illustrations. They are enchanting and whimsical in water color. Patrice Barton has amazing talent. She worked on them for the author, Karen Henry Clark who adopted a child from China and had no story to tell her about her young infant life before she came to America. Clark uses prose to tell the tale of a family in China who doesn’t have enough food to feed their baby and want to give it a better life. In the mean time, another family across the globe in America is preparing their home for a baby by planting a garden and filling a room with books and toys, still no baby comes. Both families have to rely on the moon to carry their wishes. Sweet Moon Baby is a wonderful book for parents with adopted children and children who wonder why their biological parents would give them up. I recommend it for all ages and can honestly say it will be a favorite in our home. Author Bio: Because I loved books even more than candy or birthdays, I decided to write one when I was four years old. When I realized no one could read my loops and dots, I dictated the story to my father. He patiently wrote it on my blue-lined tablet. My mother read it with me daily, insisting it was the most exciting tale she had ever heard. Getting published became my ambition. I had no idea how difficult this would be. Years later I discovered the right story when we adopted our daughter from China. I made up an adventure about her imaginary journey down the Pearl River. SWEET MOON BABY became my first published book. To date, I have not become a waitress. From this magically right beginning came the concept of Beginner Books, exacting blends of words and pictures that encourage children to read – all by themselves. Hailed by elementary educators and remedial reading specialists, these enormously popular books are now used in schools and libraries throughout the English-speaking world. Mary’s review: This is a wonderfully written story about a young boy who buys a small gold fish from Mr. Carp who warns him about feeding Otto the fish too much. “Just this much”, he says, “and no more” as he holds his fingers in a small pinch. “Never more than a spot, or something may happen. You never know what“. The little boy doesn’t listen and feeds Otto his fish more than he should and quickly learns the consequences of not listening. He calls on many people to help him out of the predicament he has gotten himself into. It reminds me of how we get ourselves into situations by not paying attention and then having to take accountability for our own actions. It is a simple concept in learning to listen, obey and choose – that choices we make do result in consequences but that we don’t have to be afraid to ask for help when we need it. After I read this to my 3 and 5 year old granddaughters, they each read it back to me in their own way as I had read to them separately. They basically came up with the same concept, but at different age levels. They loved the illustrations and the colors. The 5 year old even colored in the black and white portions of the illustrations to suit her. This is a great little book and I recommend it for children ages 3-9, although I feel it wouldn’t hurt for anyone to read it at least once. About the author: Helen Palmer Geisel (September 11, 1899 – October 23, 1967) was an American children’s author. She was married to fellow author Theodor Seuss Geisel, better known as Dr. Seuss, from 1927 until her death. Add A Fish Out of Water to your Goodreads shelf or visit the publisher’s website.